Award types are the various financial aid awards you give to students, whether grants or loans, whether from a government entity or some other scholarship fund. As you prepare to offer financial aid to students, you should review the built-in Federal awards and add any additional awards your school offers. 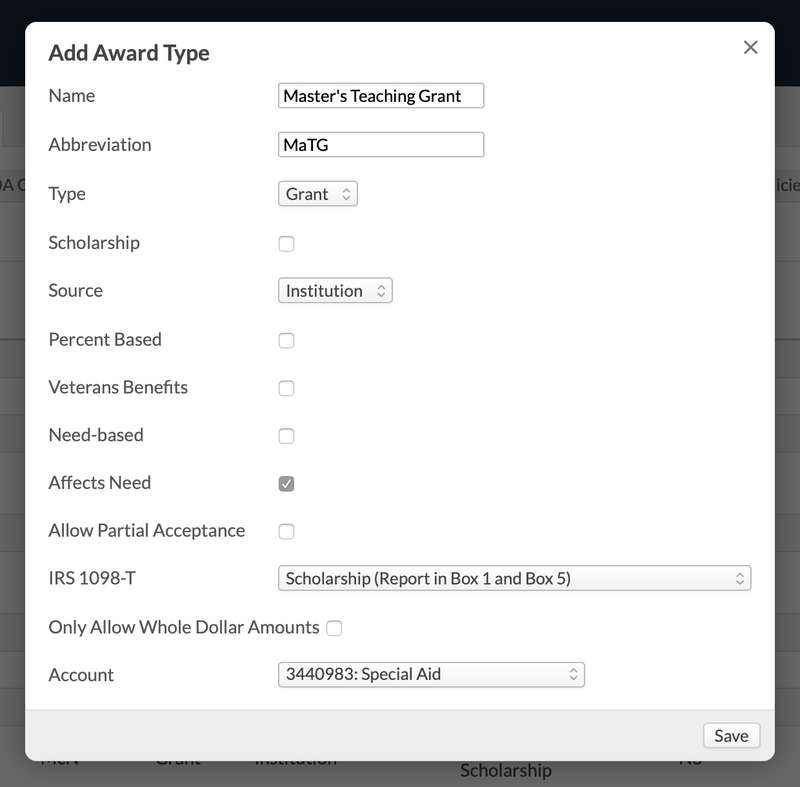 To get started, go to Financial Aid > Settings > Award Types. If you're using the DOE integration, the awards marked (COD) (and/or any custom award types you're reporting as a (COD) Federal award—see below) will be used when syncing your data with the Common Origination and Disbursement system. You cannot offer any of these awards until you associate it with a liability account. Select the liability account for this award. Each award type requires a corresponding liability account. Ask a Financial Admin user to review your school's Chart of Accounts and make sure the correct accounts have been set up. What type of award is it—a Grant or a Loan? What is the award's source? Choose from Federal, State, Institution, or Other. If you select Federal, you must then select the Federal aid types as which you will report awards of this type to the Department of Education. Your selection will also enable Populi to automatically calculate any origination fees connected to this Federal award. If you're using the DOE integration, take special care with your selections; they will be used when syncing data with COD. Check if Need-based and whether this award affects the student's financial need amount. How should this award be reported on IRS 1098-T's? Do you want to only allow whole dollar amounts? That is, $1089 instead of $1088.78, etc. Finally, select a liability account which will be affected by transactions involving this award. To edit an award, click its name and make your changes. Your changes will only affect future awards; if you've already added this award to a student, your changes will not be retroactive. Next: set up aid classifications.